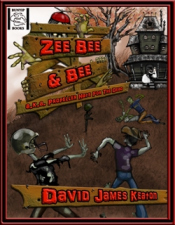 David James Keaton has a new e-book that has just been released by Bunyip Books called ZEE BEE & BEE (a.k.a. Propeller Hats For The Dead) - Told from the perspective of the sluggish employee of a "Zombie Bed & Breakfast" tourist trap, this horrific love letter (and middle finger) to the zombie capital of the world, Pittsburgh, Pennsylvania, chronicles the daily workings of a staged zombie assault and rehearsal of an apocalyptic scenario. The question of whether the cast are really attacking hotel guests, who is dead, alive, or just annoying as hell will be answered in a satisfyingly gruesome manner, sparked by an undead love triangle and a tipping point of post-modern, pop-culture references. DarkMarkets caught up with David and throttled some interview questions out of him. DJK: ZEE BEE & BEE is the story of a Bed & Breakfast where the staff are paid to attack the guests as sort of a fun Apocalyptic Honeymoon weekend experience. And in a desperate attempt to get the staff member "zombies" to try harder and make their assault more believable, their boss hides a loaded rifle in the hotel, hoping that the threat of death gets everyone to pick up the pace and take this "game" more seriously. Of course, it then quickly descends into madness and mayhem. There is a twist to the story that people may see coming, which would be handy actually because then they won't need to re-read all the jokes than hinge on this surprise. This time around, it was extremely tough to keep any revelatory information from the reader while still hinting at the bizarre aspects of their situation, but I've never been able to handle foreshadowing correctly, ever since my first undergraduate workshop where I gave away the ending to my story of a toilet that was sort of like a crystal ball and revealed the future. It was called "What Do You Mean The Future? When I Look Into A Toilet All I See Is The Past." Some fellow students boycotted it, but to be fair it may not have had anything to do with the foreshadowing. DM: What was it like working with Bunyip Books? DJK: Working with Bunyip Books was an incredible experience. I was given free reign to re-shape this project for the e-book format, and I'll be very interested to see where they go in the future. I'm told they are in the process of setting up a website and will be putting out a call for submissions shortly. I was their "canary in a coal mine" to see how things turned out, and they've been encouraged by ZEE BEE & BEE's success. They are in the middle of a possible name change though as, from what I hear, there was some sort of weird internet squatting going on with that name already. Fast little buggers. But, yeah, they did a great job formatting the book and compiling all the materials I kept throwing at them after every middle-of-the-night brainstorm. I was told it was a bit like "herding cats" because I kept trying to cram more and more features into the book like the Zombie Movie Drinking Game, and the amazing Foreword by author David Tallerman, and even helping me take advantage of the special qualities of the e-book itself with hyperlinks and such. They also helped secure the cover artist D.W. Stripp and keep him happy with a steady supply of promises that I would leave him alone and not email him with suggestions at 4:00 in the morning. 3:00 in the morning was cool though. Just kidding. He wanted to kill me. But the cover turned out great. I wanted something even more whimsical and innocent to draw people in so that they would be kind of surprised and horrified when the story took a turn. And then they all explained to me that this was the definition of "false advertising." Eh, they say "tomato..."
DM: What's the best piece of advice you've ever heard/given out for new writers? DJK: The best piece of advice I've ever heard would have to be "Don't use too much soy sauce with your squid or it will activate the neurons and cause it to dance in your bowl." The best piece of writing advice then would be to switch "soy sauce" with "adverbs," "squid" with "fiction," and "dance" with "defecate." Actually I just made that up because I just saw this sweet squirming squid dinner video online this morning. But it sort of makes sense, doesn't it? No? Okay. Writing advice. Don't write and drive, even in the passenger's seat. Causes nausea and despair. If you want your published work to get some time in the spotlight, email [email protected]!